There are no words to describe the Christchurch tragedy. The loss of life in such a brutally executed massacre is unimaginable and unpardonable. It begs belief that a human being was capable of such brutality on a fellow human being. It will be impossible for the families of those who were killed to come to terms with this tragedy. Equally, the families of those whose lives are still in danger, and others who were badly wounded, must be still in shock and disbelief, praying for the recovery of those who were wounded. The people of New Zealand, and all peace loving people in the rest of the world are in absolute shock as well and this is an incident that will remain etched in their memories for a long, long time to come. Sadly, incidents like this have happened in many parts of the world, and are still happening. Some countries in the Middle East experience these virtually on a daily basis. People in Iraq mourned and still are mourning hundreds of thousands who died consequent to the war on terror unleashed after 11 September 2001. Most if not all who died were innocent people. Children, mothers, fathers, grandparents and families. Killing is going on as we speak in Syria where parts of it have been rendered to piles of rubble with hundreds and thousands killed and millions displaced. Life in Afghanistan is and has been one of terror and uncertainty for a long time. Thousands have died, many rendered homeless. Terror attacks have happened in the USA and more than 3,000 innocent people died in the infamous 2001 massacre at the World Trade Centre in New York. Terror attacks have happened in many Western nations and could happen anytime, anywhere. Were all these due to Islamic extremism or was Islamic extremism precipitated by Western expansionism and exploitation? Were Muslims, in general, strong and vocal in their condemnation of violence perpetrated very clearly and definitely by Islamic extremists? Or has their relatively muted condemnation resulted in the growth of anti-Muslim feelings and given rise to extremism against Muslims? How much has the media contributed to this rise in anti-Muslim feelings? Has the media taken a biased view about the feelings and attitudes of an overwhelming number of peace-loving Muslims? These and many other questions need to be asked and discussed by all peace-loving people if we are to avoid the killings that have happened and still are going on in several parts of the world. We may not get all the answers or we may not find agreement on any of the answers. But a global discussion will certainly highlight the issues that are contributing to the spiral of violence against innocent people. In relative terms, relative to what has been happening in the last 15 years or so, parts of the Middle East that are engulfed in violence, were peaceful. No doubt autocrats who ruled these parts perpetrated violence against their own people, but in comparison to the violence they have since experienced, there is hardly a comparison. The attempt to introduce democratic governance to people who have never experienced democracy, has created mayhem in those countries. Islamic extremism is blamed on some Muslims while the country that promotes it, lives it on a daily basis, and which bankrolls the spread of extremism is forgotten. The countries that are strategically linked to that very same fountain of extremism is looked upon as good Samaritans who are out to destroy Islamic extremism, which ironically is promoted and spread and funded by the country in their orbit of strategic interest. How could one logically destroy Islamic extremism if the hand that feeds it continues to feed it? Islamic extremism appears to be a tool that is being used to fight a battle within Islam itself. The Sunni Shiite schism and the clash that has ensued for centuries appears to be unabated and being played out to this day. This clash and the battle between the two centres of this Islamic divide which has been exploited by the expansionist and commercial intents of the West as well as Russia has left ordinary Muslims as well as the rest of humanity caught in this quagmire of violence. Millions of people have fled the theatres of conflict and war and have taken refuge elsewhere. Many are dying in war situations as well as through terrorist attacks as happened last week in Christchurch. Whatever location they are dying, the deaths are happening on account of the clash within Islam and the exploitation of this clash by others to gain control of a resource that the region possesses, oil, and to sell arms and ammunition and modern warfare machinery to the warring sides. The industry that is most content with this situation is obviously the arms industry, who in all likelihood will continue to exert influence on political and administrative decision makers that arming the warring partners is the only way to maintain a defence balance in the region. So, the most modern, sophisticated and expensive war machinery is sold to the region in the name of avoiding an open, full scale war, while the so called limited war kills millions! In this climate of subterfuge brought about by a clash within Islam, hundreds of people will continue to die in the region and in other parts of the world. There will be more Christchurch type attacks that will shatter the peace and serenity of other cities. Hate mongers will target innocent Muslims and Islamic extremists will target human beings irrespective of who they are in retaliation. How could one arrest this cycle of violence? Only Muslims can. They can end the ancient enmity and the clash within Islam and prevent the exploiters from profiting from this clash. Will this happen? Unlikely as those who are profiting from this will not allow it to happen. However, Muslims and other communities living in various countries could recognise their common enemy which is the clash within Islam, and work together within their own countries to mitigate the ill effects of this clash. They could also condemn in outright terms, the violence perpetrated by Islamic extremists and also expose the scavenger vultures who are promoting this clash for their own benefit. 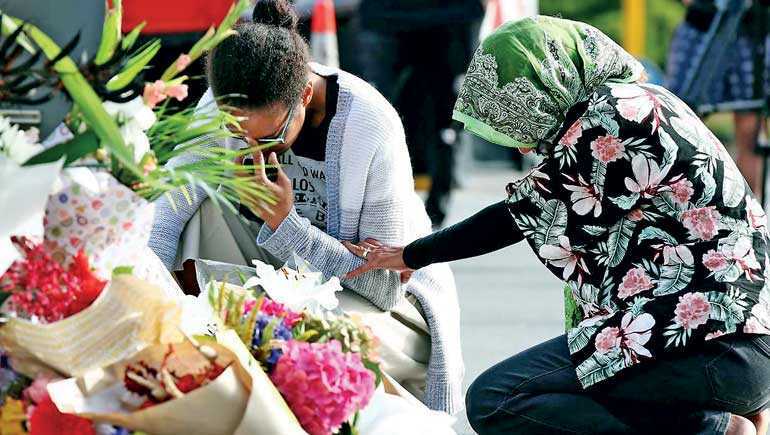 Christchurch was only a symptom of this subterfuge that is being played out by some vultures waiting to profit from an escalation of violence through retaliation and further the exacerbation of the Islamic divide.